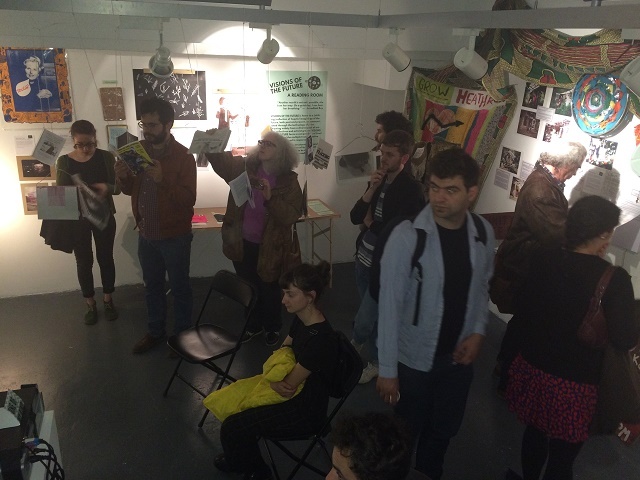 This year’s DIY Cultures festival at the Rich Mix centre in London built on a strong annual tradition that has established the zine, small press and artists book day festival as the most popular of its kind in London. There is a distinctive creative and collaborative energy at DIY Cultures that sets it apart from other publishing fairs and makes it welcoming and inspiring for everyone. In fact, it’s arguably the most inclusive and representative zine and book fair in the city, with a solid following of artists and activists. This year, in a jam-packed day of topical and informative panel discussions, dozens of radical and colourful zine and small press stalls, and practical small-group workshops, the 4-floor events space was overrun with people. The festival prides itself on hosting and encouraging alternative and independent publishing as a means of communicating and expressing ideas, identities, social justice activism and radical politics. In this context, it was particularly difficult to reconcile the progressive spirit of the festival, in the perfect setting that Rich Mix has consistently offered to DIY Cultures, with the fact that the events space is at risk of closure as Tower Hamlets council aggressively pursues full settlement of debt. That sad reality aside, there was much to enjoy, admire and inspire. Some highlights included the first panel discussion, called ‘DIY Justice – grass-roots social justice campaigns’, which introduced the ‘DIY Justice – Emphemera from Social Justice Movements’ exhibition. Philosopher Nina Power talked about her badges, on display in the exhibition, as signifiers of a kind of politics you can literally wear on your sleeve; while Ru, of Grow Heathrow, introduced the otherworldly photographs depicting life ‘off the grid’ and resisting the airport’s expansion. The exhibition is on display in the Cafe Gallery at the Rich Mix until the 12th of June, and is well worth a visit. It showcases a range of DIY social justice movements that use art and craft as communicative tools, from the contemplative beauty of the Craftivist’s Collective’s embroidery to the presence of an unsettling, carnival-like Papier-mâché figure of former Justice Secretary Chris Grayling. The exhibition includes Sofia Niazi’s beautiful and haunting gif images of the women affected by the systematic injustice of the “war on terror” – simple candy-coloured images of domestic scenes where men are shadows and absences, disappeared by state counter-terror excesses. The OOMK Zine stall includes the popular ‘Intifiada Milk’, which co-editor Hudda Khaireh spoke about on stage as a brilliant example of community subversion and resistance to oppression, as well as zines about fracking, feminism and Native American belief systems. The on-stage ‘DIY Justice’ panel was followed by ‘DIY Education’, which hosted some excellent speakers on resisting neoliberal education reforms (including Shelly Asquith of Occupy UAL), decolonising education, investigative reporting by Lidia Kurasińska on university links with torture in Central Asia, and the productive and creative world of art and education in prisons. ‘DIY Science, Technology and Gender’, chaired by DIY co-curator Helena Wee, hosted hacktivists and women, particularly women of colour, who are disrupting and demanding space and voice in male-dominated industries while simultaneously questioning the ‘politics of technology’ and engaging artistically with science to explore contemporary ontology. The final panel ‘DIY Work’ brought artists and zine-makers on the topic of workplaces, labour and austerity together with union culture secretary Clara Palliard, who spoke about resisting privatisation at the National Gallery. The panel was a necessary platform for discussion about how artists and workers can organise to protect economic stability and mental health. There was an easy exchange of ideas and opinions among strangers and friends, demonstrating the festival’s importance as a safe space to connect with social justice initiatives and explore the city’s subcultures. Workshops were hosted on a range of political and creative themes that focused these conversations – practical advice on ‘police and your rights’, provocative exploration of personal activism and positionality with sorryyoufeeluncomfortable, and jewellery and embroidery classes. Every year, DIY Cultures breaks down borders between art, politics, technology, wellbeing and social justice. Visitors leave the events space with bags full of great zines, badges and other materials, ready to take on and rebuild the world. Please sign me up for the Ceasefire newsletter. Thanks.